It’s amazing how much a single conversation can influence one’s career. Years ago, Dave Lundal asked a chief operating officer what he looks for in a CIO. The answer? Someone who understands the healthcare business. Lundal took those words to heart, and now, as CIO at Presence Health, his leadership strategy is built around the idea of applying technology to the healthcare business. In this interview, Lundal talks about what drew him to Presence, the challenge of having two EHR systems — on multiple databases, and implementing an IT governance process. He also discusses what he learned going through the M&A process, and how healthcare has evolved in the past 20 years. IT is a big component of the due diligence standpoint, and so there are efforts there. And then in post-transaction, there’s all the things that happen in terms of, okay, how do we come together as one organization? I’ve had a view for a long time that my main job is to really apply technology to the healthcare business, and if I didn’t understand the healthcare business, I would have a much harder time doing that. If you can operate that way and never, ever have a technology conversation at a senior leadership meeting, there’s almost a relief that washes over those folks, because IT can be such a mystery. Gamble: So it’s really something where there’s an endless list of priorities, but there’s a plan. Lundal: I’d say we know where we need to plan, and we have done some good things and we have some good tools in place. So in some cases, it’s not, ‘I have to do a process to find a new technology.’ It’s more, ‘let’s get really specific in a population health context of how we’re going to use this technology.’ And sometimes it’s a matter of emphasis; again, getting back to the investment that is available to be made. If there was a blank checkbook, this planning would be very easy, but it’s not. So we emphasize that we’re going to put that one on the back burner and we’re going to do that one in 2017, but this is where we need to place our emphasis in 2015. That’s the more challenging and fun part, I guess. Gamble: Right. You talked about some of the similarities between SSM and Presence, with both being Catholic health systems with a decent number of hospitals. As far as making that transition, was it something where you were definitely able to draw upon experiences at SSM with things like the sheer volume of hospitals and things along those lines? Lundal: Yeah, and as I look back, my first job in healthcare IT was in 1991, so I think all of my experiences have been able to build upon each other. Even in Wisconsin we had a good-sized system, and from a revenue standpoint, it wasn’t too much smaller than where we are at Presence Health. So from a size standpoint and from the level of interactions with executives, a lot of things I was able to draw on. At SSM too I was part of a large IT organization — almost three times the size of the actual organization that I have here at Presence, and so being part of a large IT organization also has been particularly helpful. Gamble: I can imagine. You talked about the merger or acquisition between SSM and then Dean; I’m sure that was a valuable experience to have been through, just because M&A is something that’s just become so rampant in the industry. Lundal: It is. I don’t think you can escape it anymore, and I think all organizations are going to be looking at some part of merger or what is in the portfolio. For instance, one of our hospitals is being sold and that organization is going to start managing it on January 1. So you get all kinds of interesting things. Like on that one, we’ll keep them on our Epic system and so I’ll keep them as a client essentially, even though they no longer will be a Presence Hospital. From the experience standpoint, you get a lot of the range of just the emotional aspect of being in a merger. There’s all kinds of stuff that happens to prior to the merger. There’s the news that there’s going to be a sale and there are going to be bidders and it’s completely confidential on who those bidders are and they’re going to be doing due diligence and they need to talk. IT is a big component of the due diligence standpoint, and so there are efforts there. And then in post-transaction, there’s all the things that happen in terms of, okay, how do we come together as one organization? I was fairly lucky, I think, in the big one that I went through with SSM and Dean in that SSM and Dean had been working together for so long, and I was working with both organizations for many years. The other thing is that the WITTS organization — the LLC — that’s where we had the Epic system. That’s where we had our PACS system. That’s where we were doing telemedicine. We were doing so much in that organization, and it was co-owned already between Dean and SSM of Wisconsin. So when the post-merger happened and we had a consulting group come in and they were ready to get multiple people in IT from their organization to help us make that transition happen, they very rapidly kind of backed off and had nobody helping, because most of the big work had already been done by us over the last several years. But anyway, it was good experience. I hope it settles down at some point in healthcare, but it’s probably going to be a while before it kind of all shakes out, because this is a complicated new world that everyone is trying to figure out. Gamble: Yeah, definitely. It seems like now more than ever it’s really valuable to be in touch with your colleagues, and I’m sure that’s where the professional organizations really come in handy because just being at things like CHIME, I can see how many people kind of get together on their own and talk about how’s everything at your organization and what are you guys doing. Lundal: I think a lot of the conversations usually evolve around just how do you deal with the pressure. For instance, my first job at a hospital was in 1995 and I’ll tell you, coming in almost 20 years later, healthcare is a lot different from 1995 to 2015. Just the pace of IS is a lot different from 1995 to 2015. So I find a lot of the conversations around that, along with just strategy types of conversations, like how do you approach different things — those can be very helpful. Gamble: Absolutely. I noticed you’re a fellow with ACHE, and that’s just one of the last things I wanted to touch on. 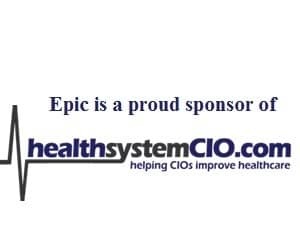 I’m starting to see more CIOs get involved with that organization, and it’s something that obviously not just healthcare IT specific, so I wanted to just ask you what you get out of that and how it has benefited you. Lundal: I went through the process to become a fellow of the American College of Health Executives, because I’ve had a view for a long time that my main job is to really apply technology to the healthcare business, and if I didn’t understand the healthcare business, I would have a much harder time doing that. Part of that goes back to a conversation I had with the former chief operating officer of the Holy Cross Health System when I was a younger guy. I asked him what he’s looking for in hiring a CIO, and he said the number one thing he looks for is someone that understood his business. I’ve taken that as my main emphasis over my career that my number one job is to understand the healthcare business. And I thought by being a member of that organization and working toward the fellowship, that as you go about something like that, you have to educate yourself and so you have to learn more. There are some aspects of it that are just really kind of documenting how much you have learned, but that would be a very good thing for me. When I’m meeting with senior leaders, or at times having to have board conversations, the conversations are never about the technology. It’s all about how it is applied. I’ll be having a conversation a week from Friday about multiple different ways that we can invest in technology in 2015, and it really needs to get back to how does it affect the business. And so I have to be good at that. I can’t just be a technologist. In fact, I’m an average to medium technology guy, but I am much better at understanding where the business is, where the business is going, and how technology can apply. Sometimes I have to do the whole Wayne Gretzky thing — sGamble where the puck is going to be. I find that for the wonderful executives in our organizations — the operating officers or the finance officers or the strategy officers — this is a whole new world to them as well, just figuring out the business is a challenge, let alone what technology is going to be needed to support it. Sometimes our lead times in technology are multiple years. For instance, the mantra I mentioned earlier that we had at WITTS — one patient, one record, anywhere anytime — a big part of that is in the population health space, you need to have that. You need that data for analytics, you need that data for point-of-care decision making. If we can get to one record, whether that’s Health Information Exchange or a program to donate your electronic medical record to independent physicians or to install it at affiliated hospitals that are not part of your organization, that provides some immediate benefit, but that’s definitely a ‘sGamble where the puck is going to be.’ But if didn’t understand what population health was all about and the whole economics of it — the business model, I’m not sure I would have pushed that. So I think knowing healthcare is a non-negotiable now for CIOs in the healthcare space. We can’t just be about, ‘we’ve got a very efficient network, the data center is up, we got the EMR deployed — you know the one that everyone said we wanted to do.’ We need to know more, and it’s helpful to me. Gamble: I think it’s so interesting to look at how the role has evolved. You have to have that business understanding. And it’s really interesting the dramatic change you’ve seen in your career over 20 years. I’m sure it’s been pretty interesting to be part of it. Lundal: It is. I’ll tell you, what I find too is that if you can operate that way and never, ever have a technology conversation at a senior leadership meeting, there’s almost a relief that washes over those folks, because IT can be such a mystery and it’s something that they don’t know a lot about. And smart people don’t like to have areas that they don’t know things about, so if you know that hey, this person is kind of one of us and to boot, he’s got the technology all squared away, it’s a good thing. It can make your life as an executive a lot easier. Gamble: Sure. Okay, well, I’ve taken up a lot of your time, but I really appreciate taking the time to speak with us about your thoughts on the industry and everything that’s going on. Unless there’s anything you wanted to add, I figure I should let you go, but I really appreciate it. Lundal: I was very happy to spend the time. I hope it’s useful. Gamble: Definitely. Thanks so much, and I hope to talk with you again down the road. Lundal: I’d be happy to. Thank you very much.